We previewed the upcoming 2011 Mazda2 subcompact a couple of months ago, but now we have more details, along with photos of its updated styling. The five-door hatchback will be officially unveiled in early December, at the Los Angeles Auto Show. The 2011 Mazda Mazda2 will go on sale in the U.S. and Canada late next year. We chatted in New York last week with Robert Davis, Mazda's senior vice-president for quality, research and development, about the Mazda2 and other topics. 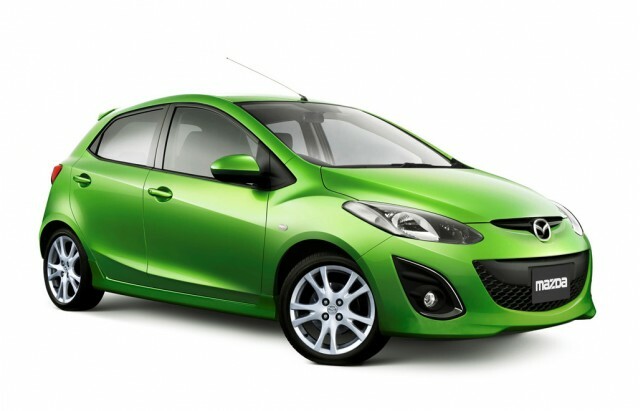 Compared to the model launched late in 2007, the styling of the 2011 Mazda Mazda2 has been mildly updated. At the front, the lower grille and bumper area have more of the characteristic Mazda "smile" face, seen in its most extreme expression on the 2010 Mazda3. Any updates at the rear are close to imperceptible, though there are likely minor tweaks to dimensions and fittings. 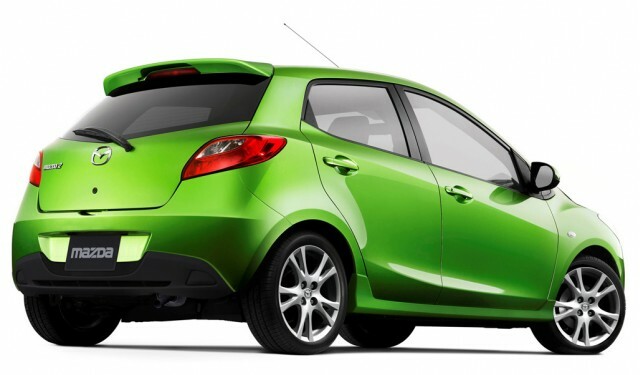 Like the 2011 Ford Fiesta with which it shares a platform, the Mazda2 wasn't originally designed to meet U.S regulations. That required numerous upgrades to structural, safety, and powertrain components. The 2011 Mazda2 will be Mazda's first U.S. model to feature its line of smaller four-cylinder engines, offered elsewhere in sizes from 1.2 to 1.5 liters. We'll get the 1.5-liter version, mated to either a five-speed manual transmission or a five-speed automatic. Mazda hasn't released fuel economy figures for the 2011 Mazda2, but we would expect city mileage between 27 and 31 miles per gallon, with highway mileage 8 to 10 mpg higher. 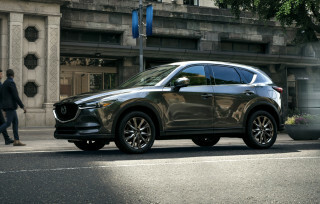 One feature that could help raise that figure for city mileage would be Mazda's iStop start-stop system, which shuts down the engine when the car stops. Unlike so-called micro-hybrid systems, which use a beefed-up 12-Volt battery and starter motor to restart the engine, iStop switches off the engine when one piston is very slightly past exactly at the top of its compression stroke. As the driver lifts off the brake, iStop sends power to the appropriate spark plug, the engine fires, and it resumes operation without involving the starter motor. Mazda's Davis told us that under the current test procedures used by the U.S. Environmental Protection Agency, iStop would show a gain in city gas mileage would be no more than 0.1 or 0.2 miles per gallon. But Mazda's data shows that in heavily urban environments (think midtown Manhattan or Tokyo traffic), iStop can cut consumption as much as 8 percent. That could mean a boost of up to 3 miles per gallon, a far more compelling figure in the U.S. market. The company is currently talking to the EPA, Davis said, about additional types of testing under which the EPA might let Mazda show an efficiency increase for the iStop system if it were fitted to the 2011 Mazda2. A rough analogy, he suggested, might be upshift lights; the EPA tweaks the ratings to grant an additional 1 mpg to cars fitted with them. Would 3 mpg be worth $300? Mazda might market iStop as a mileage enhancing option, Davis said, in those markets with the worst traffic--perhaps the cities of the Northeast Corridor, and the suburban sprawl of southern California--at a price around $300. Buyers could do their own math. The sticking point right now, he said, is that under current regulations, any car must perform a complex series of diagnostic checks on itself every time the engine starts. That would be clearly impractical if the engine were starting and stopping once a minute or more. 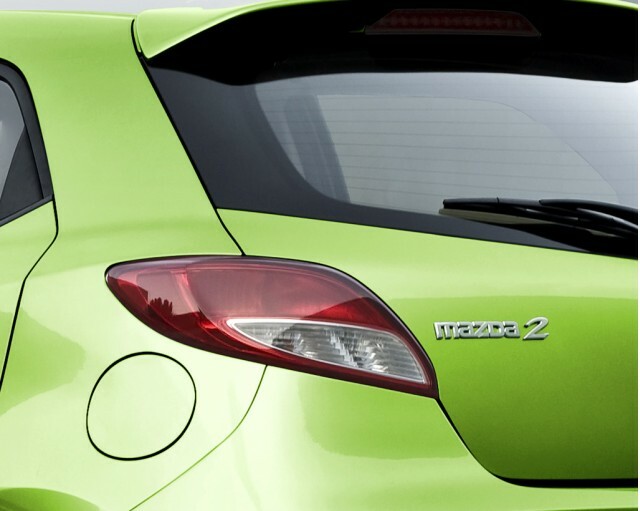 We'll only see one model of the 2011 Mazda Mazda2, a five-door hatchback. The subcompact is offered in other markets as a three-door too, but Mazda officials don't see much of a U.S. market for that style. When the latest Mazda2 (known as the Demio in Japan) was unveiled in 2007, its engineering team won global praise. In fact, a panel of international automotive journalists voted to award the Mazda2 the title of 2008 World Car of the Year. Those engineers had achieved a remarkable feat: They created a car that was not only more capable, more capacious, and better equipped than its predecessor, but also--at 2,200 pounds--fully 220 pounds lighter. For the Mazda2, they used ultra-high-tensile steel and stronger welds to take weight out of the body structure while improving rigidity. They were also able to reduce the coefficient of drag to 0.32, a very respectable number for a car less than 13 feet long. 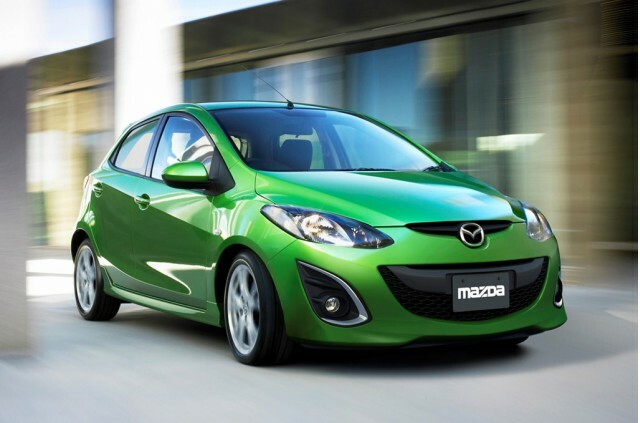 In the U.S., the 2011 Mazda Mazda2 enters a crowded field of subcompact competitors. Among others, it will face off against its platform mate, the brand-new 2011 Ford Fiesta that will also be unveiled at the Los Angeles Auto Show. Other competitors include the well-received 2010 Honda Fit, as well as the Toyota Yaris, the Nissan Versa, the Kia Rio, and the now-aging Chevrolet Aveo (likely to be replaced in 2011 or 2012). Given the available features on many of these cars, their full suite of safety equipment, and combined fuel efficiency ratings well over 30 miles per gallon, many analysts feel the subcompact segment will show slow but steady growth. Automakers, too, need these cars to sell, which will help them meet increasingly more stringent fuel efficiency standards between now and 2015.